A simple lacinato kale salad that is packed full of vitamins, minerals and nutrients. A powerful super brunch. In a small bowl whisk together the olive oil, lemon juice, salt, and pepper. Pour the dressing over the kale leaves, and using your fingers, rub the dressing into the kale leaves. Make sure to work each of the leaves. Cover and set aside for at least 30 minutes to allow the olive oil and lemon juice to soften the kale. When you are ready to serve the salad, heat a tablespoon of cooking oil in a small frying pan on medium heat. Add in the lardons and cook, stirring frequently, until most of the fat has rendered and the lardons are starting to brown. Remove the cooked lardons, leaving the grease in the pan. Add in the walnuts and cook, stirring frequently, until the walnuts are lightly toasted, about 3-5 minutes. Pour the hot bacon and walnut mixture, over the softened kale leaves and toss. Toss in the cranberries and parmesan cheese. Serve immediately. 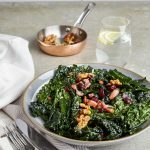 Get this recipe for Simple Lacinato Kale Salad with Walnuts, Bacon, and Lemon Dressing at https://www.theworktop.com/breakfast-brunch-recipes/lacinato-kale-salad/.